Which do you like better? 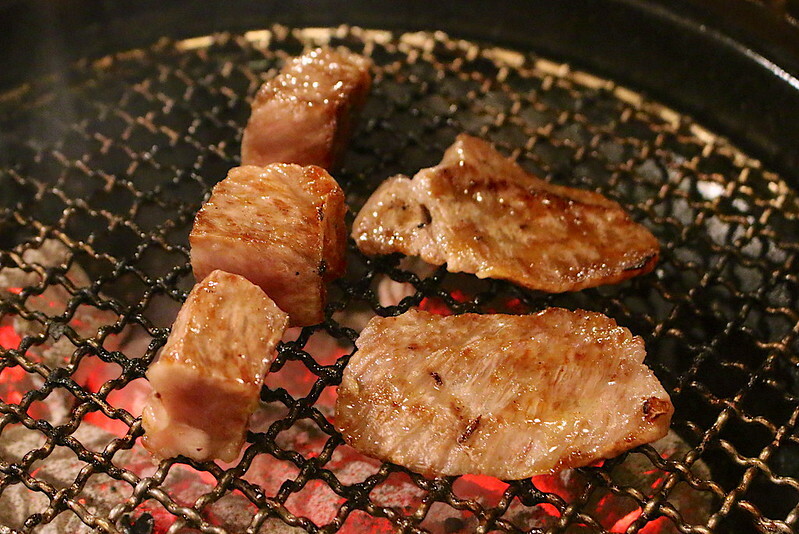 Sizzling yakiniku (Japanese BBQ) or a good slab of steak? Well, actually, the way of grilling matters less than the quality of the meat. 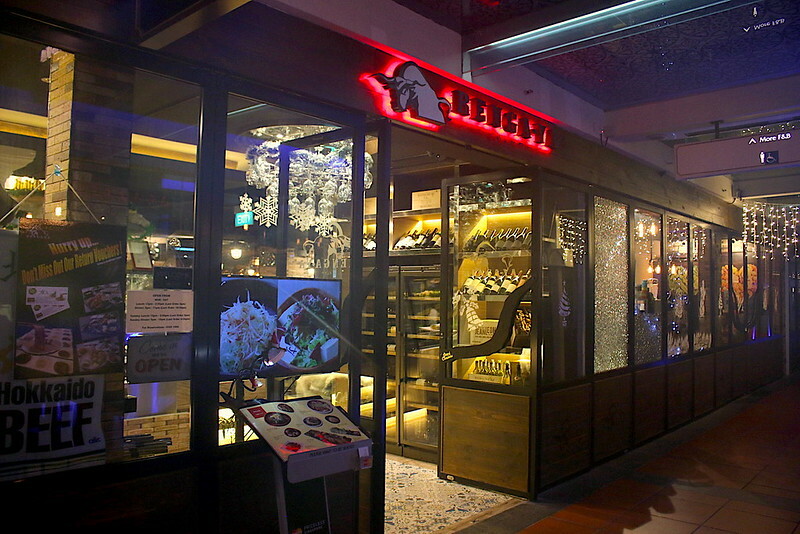 Renga-Ya at CHIJMES offers both styles of cooking in one place, with prime wagyu from Hokkaido and Kagoshima, Japan. 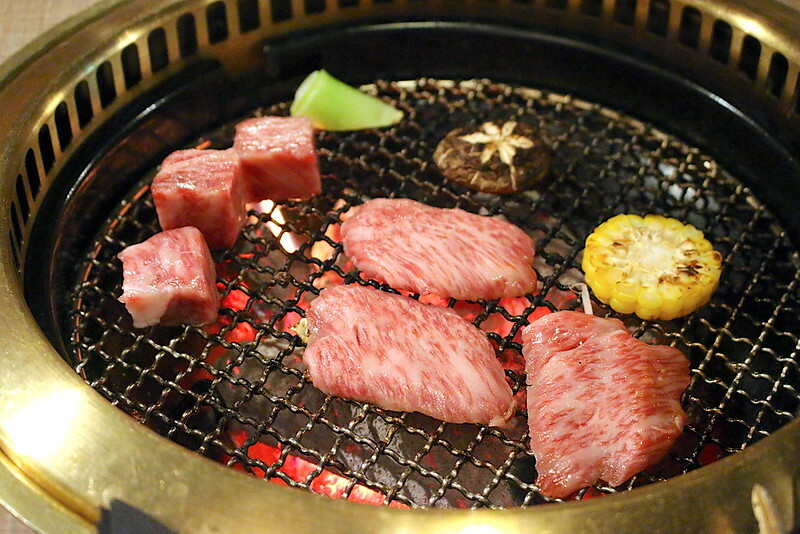 The carefully sourced “Oakleaf” brand of prime beef from Hokkaido features unique natural breeding, without the use of antibiotics and genetically modifed feed. Instead, herbs are mixed in the feed to add a natural refreshing flavour to the meat. From Kagoshima, Renga-Ya imports Kuroge (Black Hair) A5 Grade Wagyu famed for its well-balanced fat marbling and and full-bodied flavour. This is the fattiest grade you can get. 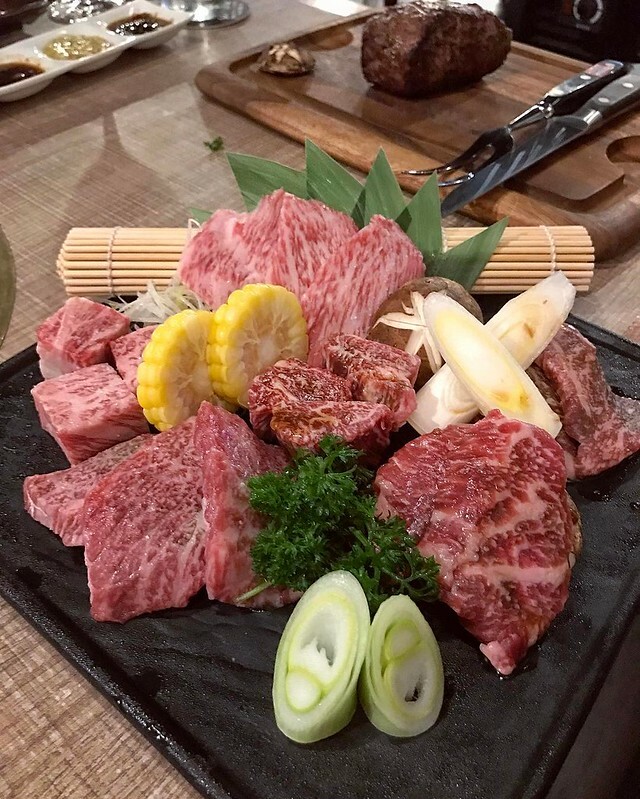 As Renga-Ya is able to import whole cows from both Hokkaido and Kagoshima, diners can look forward to a wide-range of cuts for Yakiniku and steak. 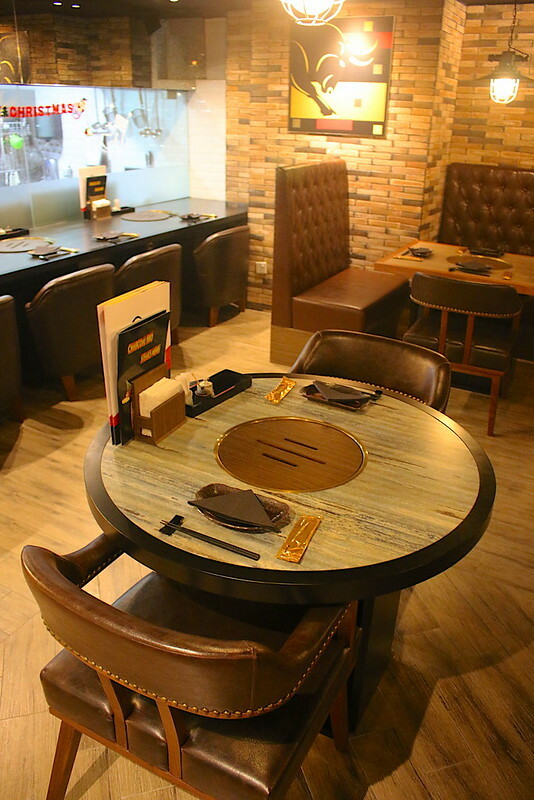 Renga-Ya means “Brick House” in Japanese, so the interior is somewhat reminiscent of a traditional Western steakhouse. 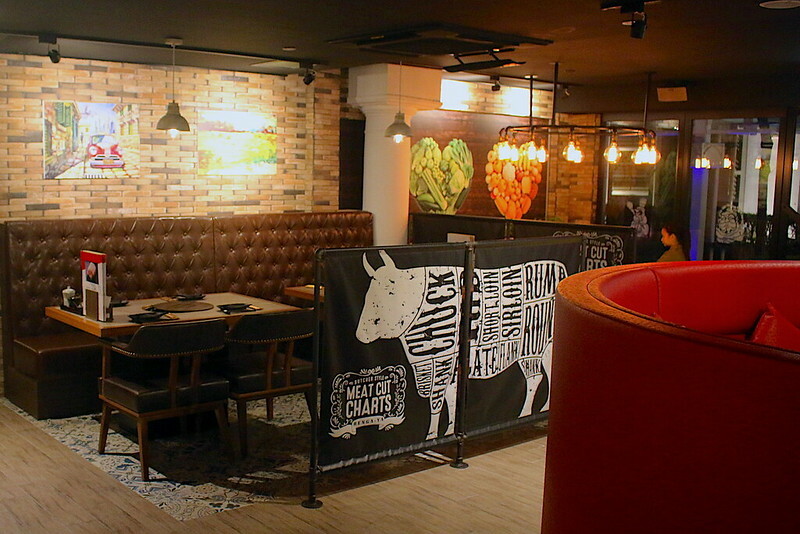 The wooden flooring and brick walls anchor the place with a warm and cosy rustic vibe, while splashes of bright colour in the sofas, seats and wall murals provide contemporary lift. This appetiser of slow cooked Hokkaido beef Tataki is made in house, served with sweet and crunchy onion and premium myoga (Japanese ginger). 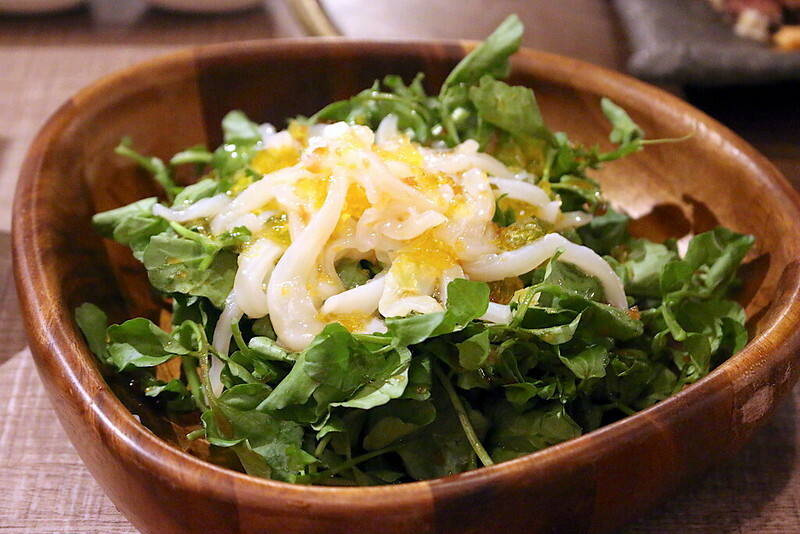 I was amazed at how much I liked this raw squid salad with yuzu jelly and homemade citrus dressing. Normally I am not a fan of ika but they have outdone themselves pairing the squid and the dressing. And now for the main course. 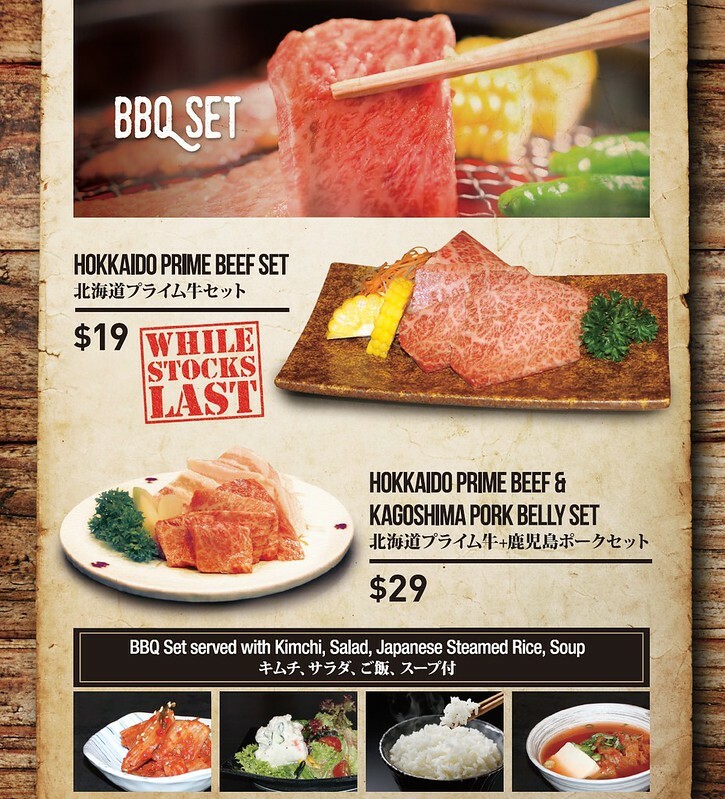 The BBQ Beef Platter (300g at $89.00 and 500g at $139.00) offers different cuts of meat from Hokkaido (foreground) and Kagoshima (see the A5 marbling in the background). Each part brings a different texture and intensity of flavour. We are advised to try the less fatty Hokkaido meats first. 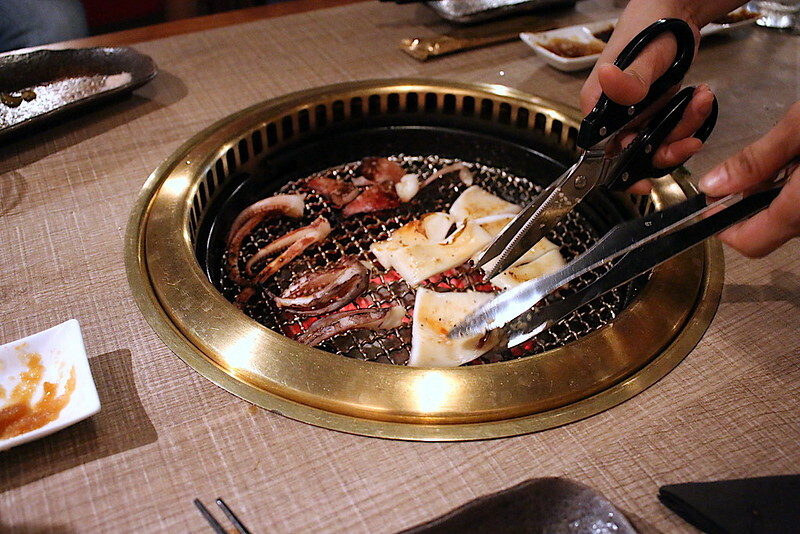 The meat is cut to precise thickness so that they will cook evenly over the hot charcoal. 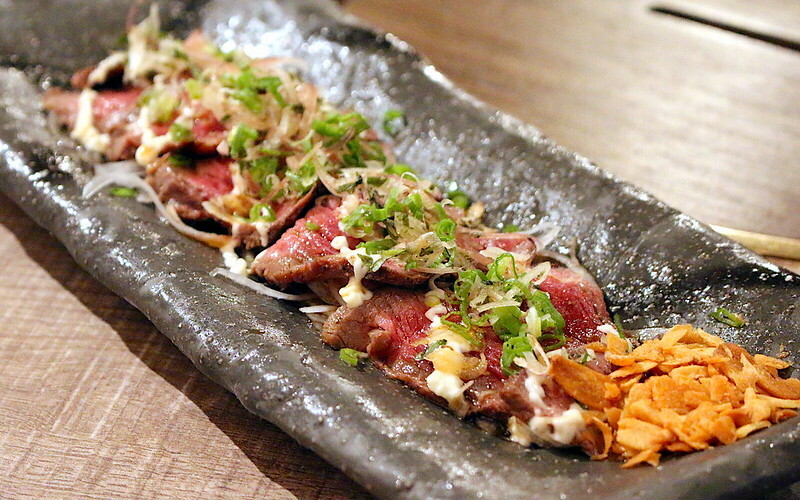 The Karubi (short rib) and Jou Rosu (chuck roll) don't take long to reach desired doneness. 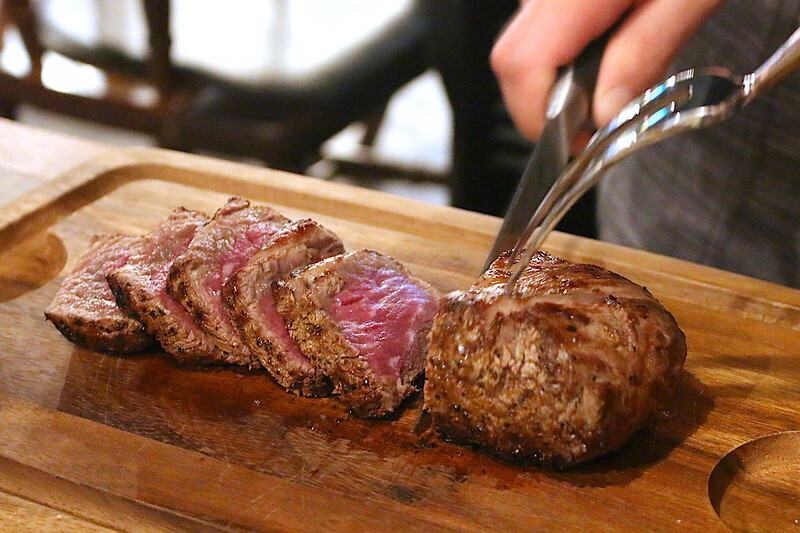 While they are tender, they also yield a more robust beefy flavour that just gets more intense as you chew. 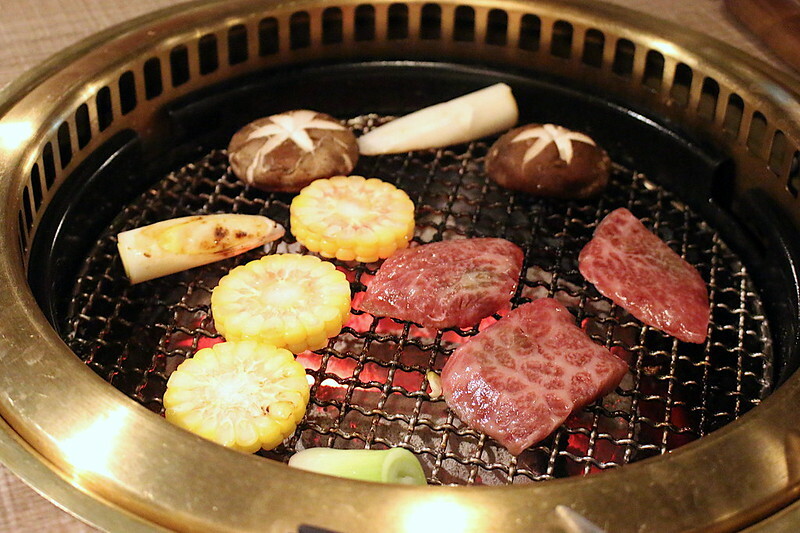 The Kagoshima meats are the ones that almost melt in the mouth. Some people find A5 grade wagyu a little too "greasy" but it's just buttery heaven for others. Here they are, wonderfully caramelised. My dining partner really enjoyed the meat. My pieces had some sinew so they needed a little more work chewing. For steak, there are various cuts. 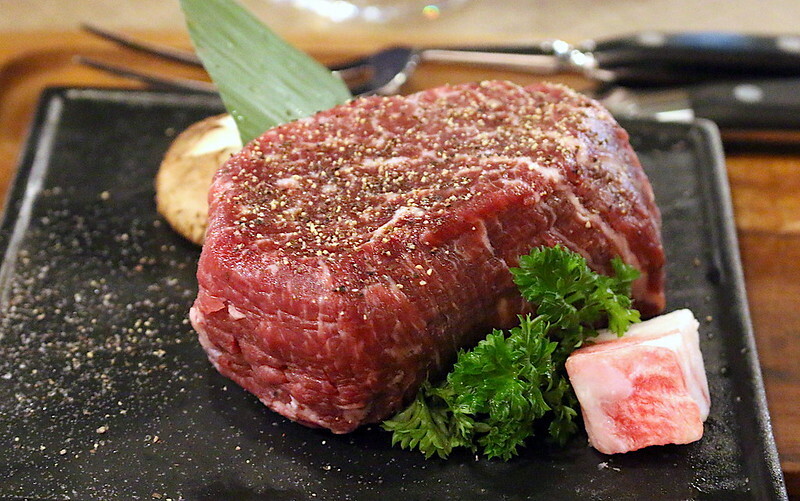 From Hokkaido, we have rump (from S$39), ribeye (from S$59) and tenderloin (from S$69). If you prefer Australian beef, they carry the Black Angus tenderloin. The steaks are served with three dipping sauces - Special Renga-Ya Steak Sauce, Ponzu Radish Sauce, and Peppercorn Sauce. 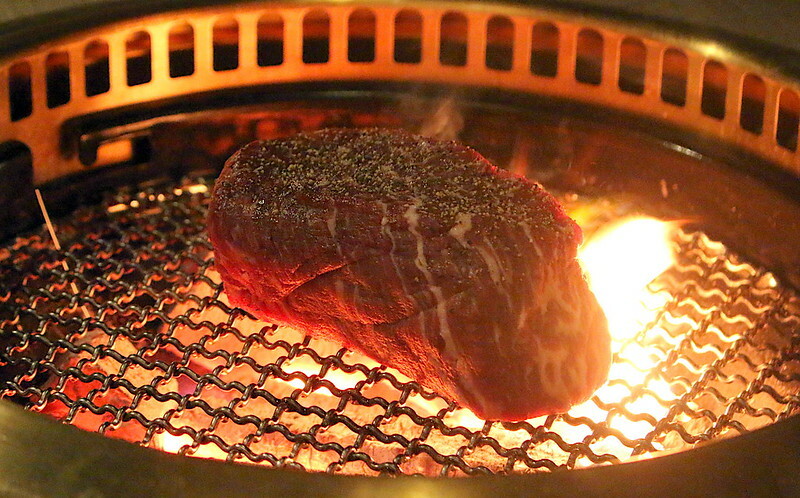 The staff can help you grill the steak table-side to your requested doneness. They have a special timer for the different weights of meat. This is a 300g slab. Would you like some medium rare steak? The Black Angus is less fatty and firmer in texture. 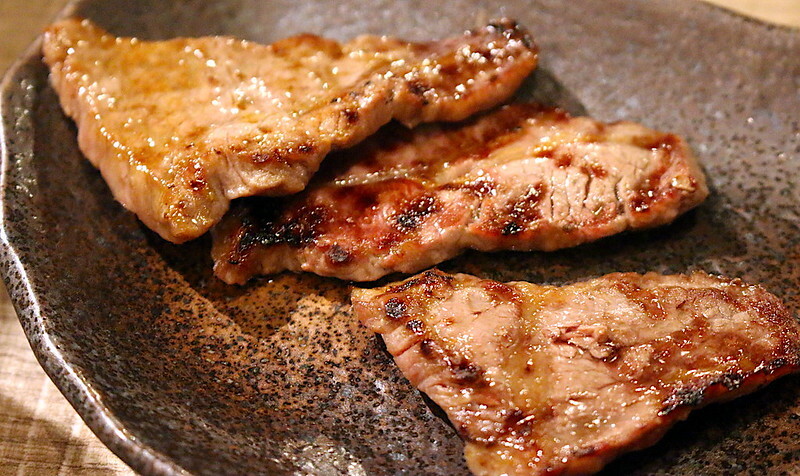 It's probably better as a thick steak than thin slices of yakiniku. Those who are not beef eaters will be glad to know there's fresh seafood from Hokkaido to enjoy as well. 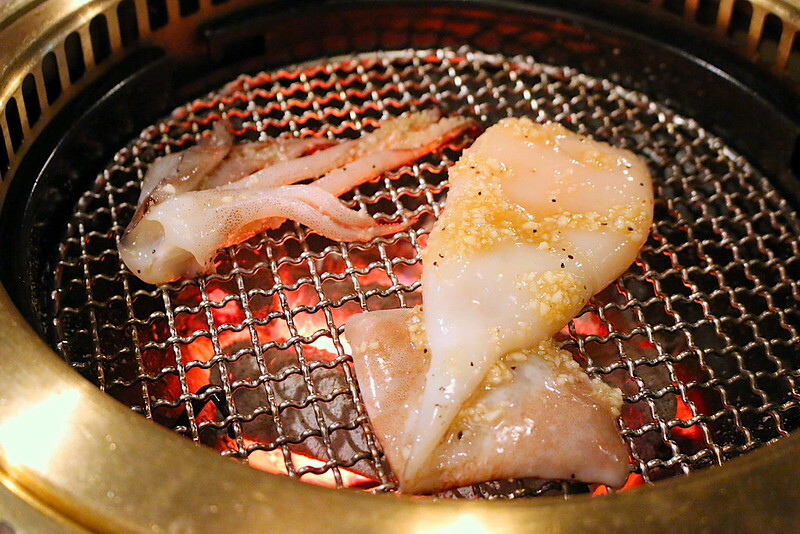 Here's the whole squid, very reasonably priced. It's marinated with garlic and soy. The server will cut it into bite-size pieces once it's done. I'm normally not a fan of squid, but these are pretty good to snack on. Dessert is something they invented themselves. 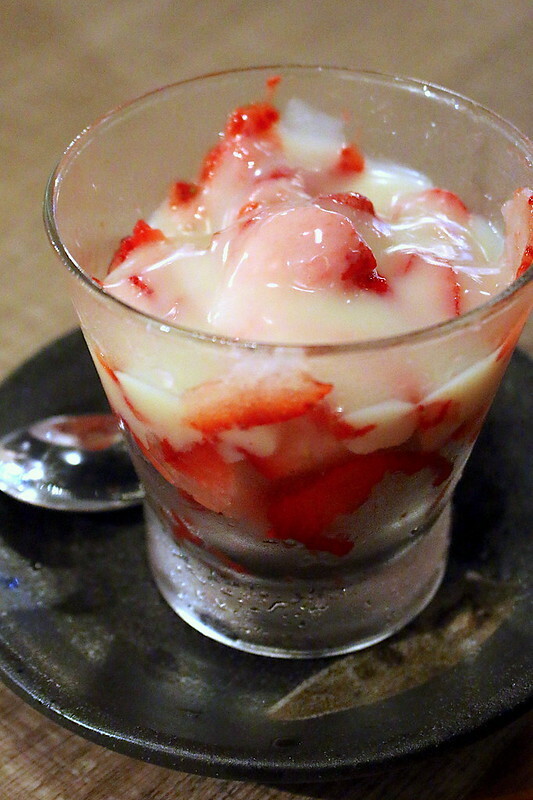 These are fresh and fully ripe strawberries, frozen and shaved lightly like a snow ice dessert, then topped with sweet milk. It's genius, and is incredibly refreshing after a hot BBQ meal. For lunch, there are Hokkaido Prime Beef BBQ sets from S$19 served with kimchi, salad, rice, and soup. That's really good value.